All too often, retail brands look at online and in-store shopping experiences as separate worlds with little overlap. In-store retail shoppers are segmented into one column of the spreadsheet and online shoppers into another. Clean and easy. Unfortunately for retailers and marketers, the real world is not so binary. The modern customer journey weaves across channels, with multiple touch points through advertising, websites, in-store, and increasingly, through social media. Brands are dedicating more resources and time to social media than ever before. Building a strong presence on social media is a priority for all brands, especially for retailers who are searching for personalized ways to connect with their customers online. Communicating with customers through social media may start online, but it shouldn’t stop there! Leveraging your social media content in-store through digital displays can help bridge the online and in-store experiences for a customer. There are three ways to integrate social media into the retail store. Considering the huge amount of effort that often goes into curating content for the myriad of social platforms out there, it would be a shame if a post was buried after a few short hours in your followers’ newsfeeds. Putting social media to work within the retail environment adds significant “shelf life” to your content. Displaying social media content within the retail store allows your content to live on after a social platform decides to stop serving it. This positions your content to go beyond a customer’s smartphone or desktop to help drive in-store sales. Creating enough content to fill the bottomless pit of social media channels is no easy task, especially as the organic reach of a post continues to fall. Brands will often turn to customer-generated content to help fill their social media channels with a steady stream of pictures and comments. Retailers have the opportunity to use their physical space to inspire customers, create Instagram-worthy moments in the store, and encourage them to share the experience online with a branded hashtag. 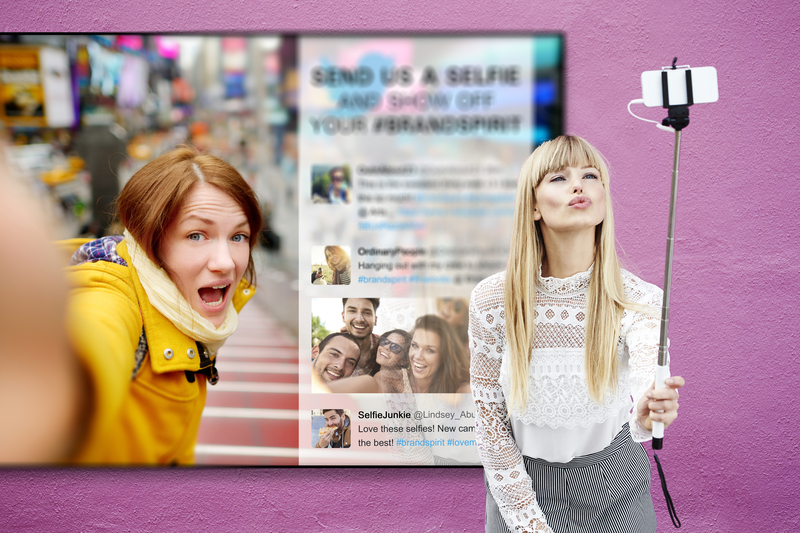 Customer-generated content can be a valuable resource for your social media channels and, when appropriate, can be shown on digital displays within the store. This may sound like a risky endeavor, but don’t worry; customer posts can (and should) be vetted by an automated system or a brand manager before being displayed. Embrace the power and creativity of your customers! Social media communication is a two-way street — use this to build a relationship with the customer. If your customer posts while they’re in the store, a brand has a brief window to respond to make an immediate impact on a purchase decision. Here’s a scenario: the in-store digital signage is promoting a branded hashtag. When the customer uses the hashtag, they immediately receive a response from the brand with a special offer. Now, the customer is at the point of purchase, with a special offer and they were just engaged at a one-to-one level. The path to purchase just became very clear. A loyal following on social media is a powerful tool that can be leveraged with in-store digital displays. Social media has become a key part of the omnichannel retail experience — bridge the online and in-store experiences for your customers, and may your content live a long and fruitful life within the four store walls.